In more than seven years of photographing and tasting food, I do get jaded but once in a while, you come across something that utterly wows you and restores your enthusiasm for culinary excellence. Ki-Sho at 29 Scotts Road is one of those places. 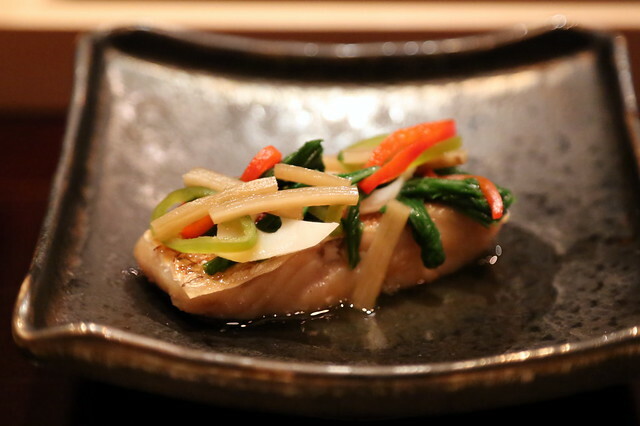 Gorgeous food, fabulous seasonal ingredients and an amazing interpretation of omakase. 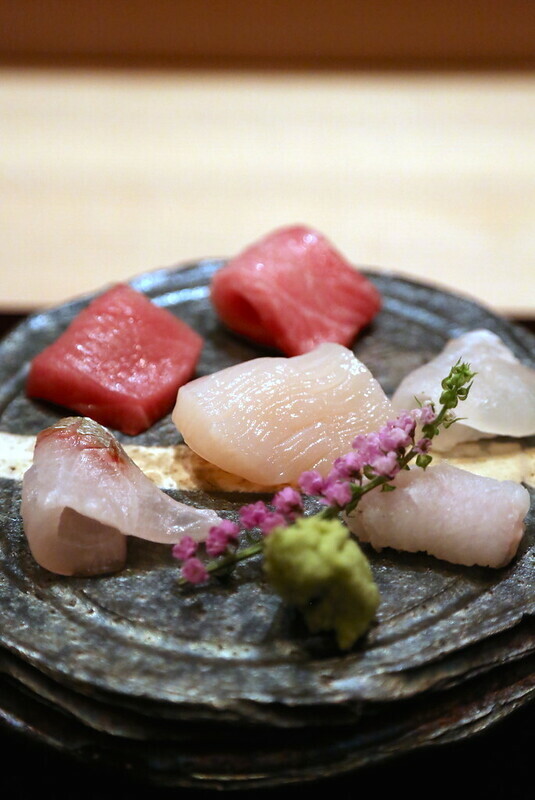 The extremely affable Kazuhiro Hamamoto helms this fine-dining restaurant as Chef de Cuisine. 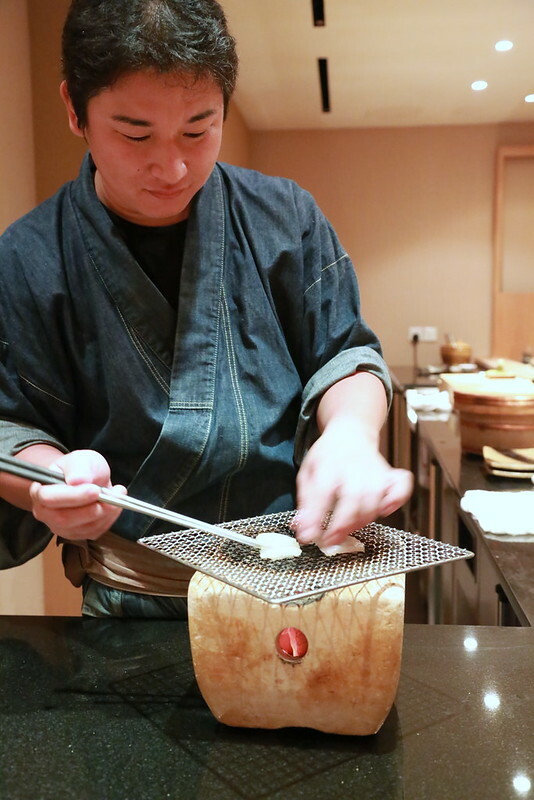 He has worked at some of the most celebrated dining outlets in Kyoto and Singapore, most notably Waku Ghin at Marina Bay Sands. 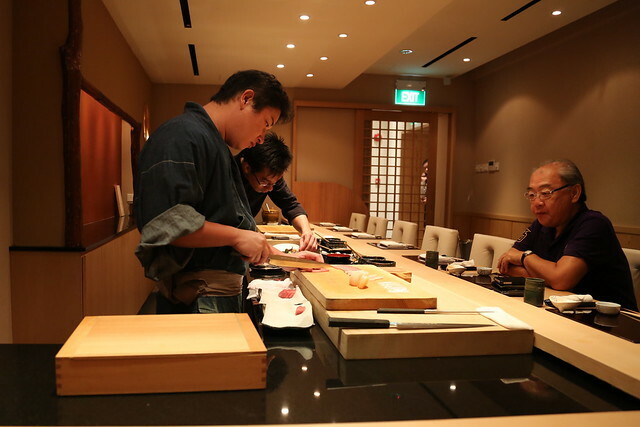 The food at Ki-Sho is a strong reflection of his personality but he tries to keep to Kyoto traditions. Chef speaks pretty good English (he's been here since 2010), and he explained many of the ingredients to us. The name Ki-Sho refers to an aristocratic or master craftsman, and speaks of the dedication and heart that's gone into perfecting the trade skills. 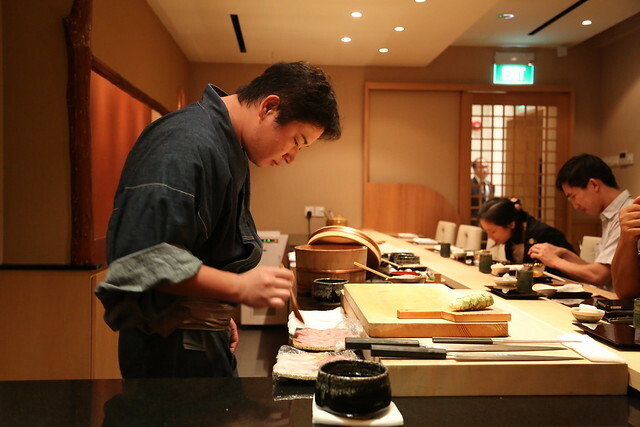 At Ki-Sho, the counter seats about 11 and you can watch the chef at his craft. I love watching him slice the fish - amazing knife control. 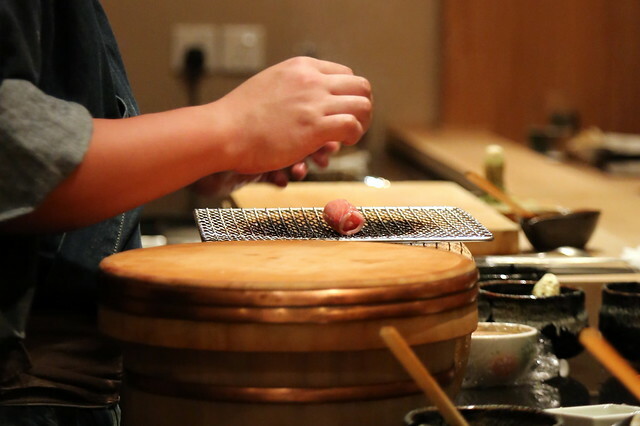 The menu here is simple: the S$300++ Aoi six-course menu or the S$450++ Kai nine-course menu. But you get more than just six or nine items. Lots of little additions make this a pretty filling meal. We had the six course menu showcasing the best of autumn delicacies. Pregnant Sweetfish! This is a seasonal delicacy you get only once a year, according to the chef. The fish has been braised and simmered for hours, so even the bones have softened til you can't feel them anymore. Oh gosh - fresh salmon roe, not frozen! Just lightly seasoned with soy, these pearls burst like joy on your tongue. And I have never had mountain yam this refreshing before. It's teased into a meltingly light texture, without its usual cloying stickiness. Autumn is matsutake (pine mushrooms) season! 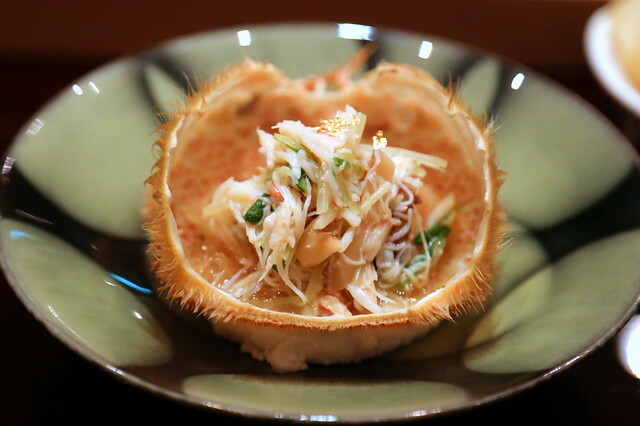 Chef shines with this concoction of horsehair crab with the prized mushroom and jelly with the essence of botan shrimp. It's a crab salad like no other. 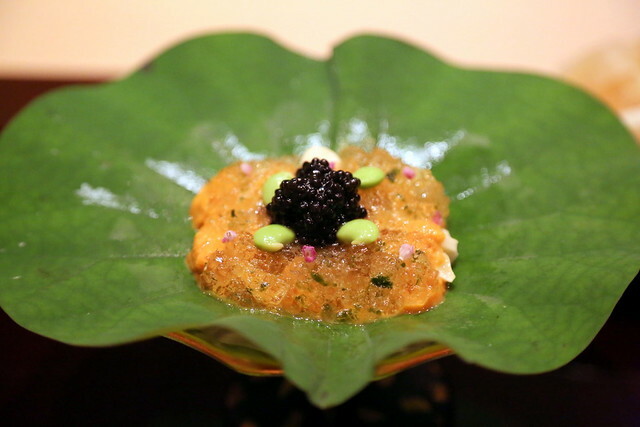 This medley of rich uni with dashi jelly and caviar is so daintily presented on a lotus leaf. Beautiful contrast of colours and flavours. One of chef's signature dishes. Incredibly fresh and sweet. 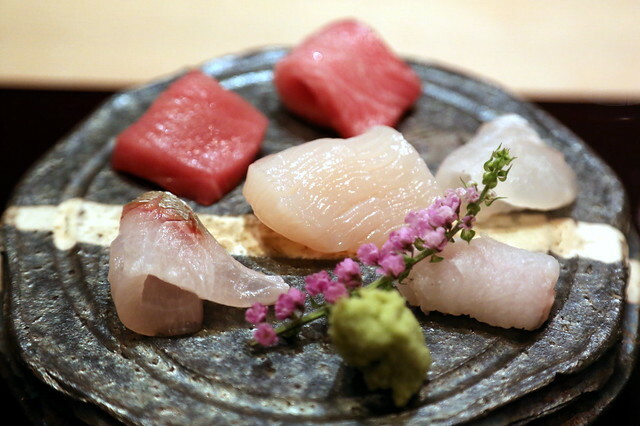 I'm told the seafood is flown in four times a week from Tsukiji. I must note here that service at Ki-Sho is ultra thoughtful. The staff serving sashimi placed the soy sauce dipping plate on my dining companion's left side, because he had quietly observed that my friend was a left-hander. Wow. Such attention to detail. I did not even notice my own friend using chopsticks with the left hand. This is pretty unusual. 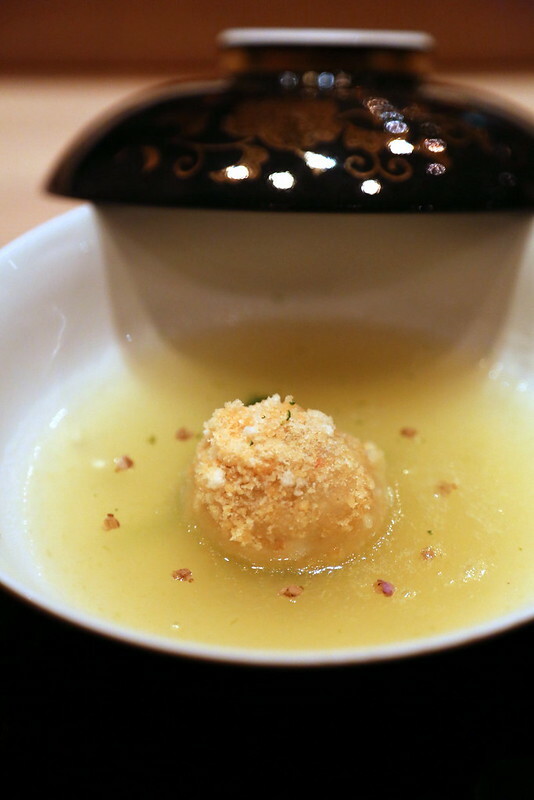 Yurine is lily bulb, and this is a winter melon broth infused with crab. The flavours overall are subtle and a change from the intensely indulgent dishes from before. And now for the seasonal fish or wagyu dish. Grilled Blackthroat Sea Perch - I love this fish. First had it at Goto, and always remembered it. 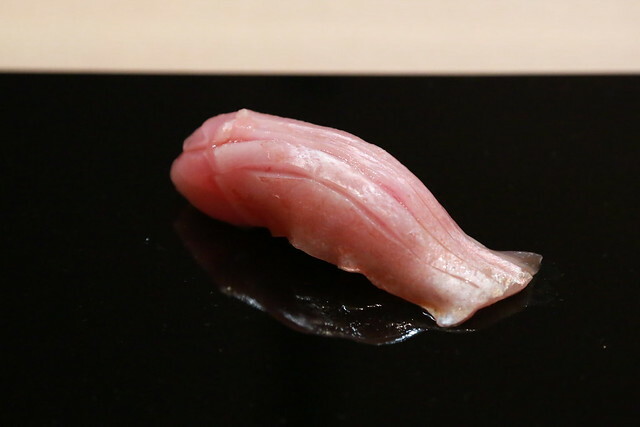 Here, the fish is grilled just gently and simmered, so the flesh remains soft and silky. Three small but thick slices of extremely rich beef. Personally I would have preferred more char and caramelization, but those who like their beef rare or medium rare will enjoy the natural taste of the meat. You get five pieces with the S$300+ menu, and 10 pieces with the S$450++ menu. But somehow we got six in total - bonus! I like how chef has made tiny lengthwise incisions - I think it helps as you bite into the fish. It almost "melts" more easily in your mouth. 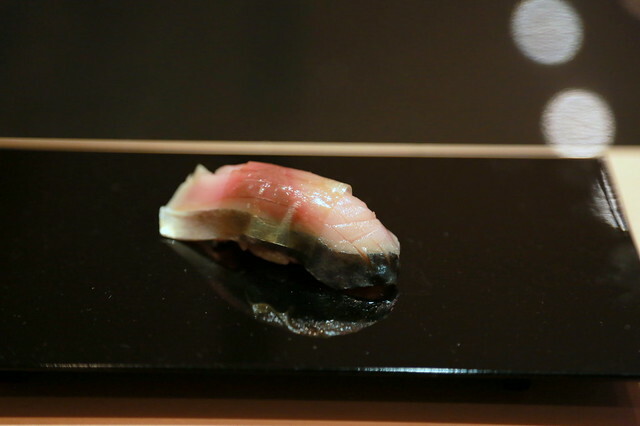 Buri (adult yellowtail) is another autumn specialty, usually wild caught. A lovely sweet aftertaste. 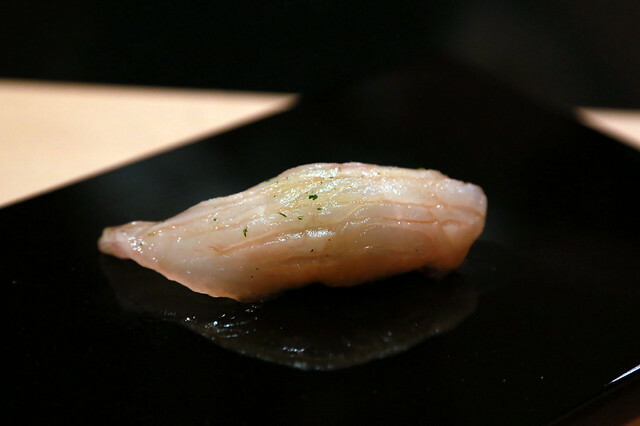 Chef also did things like a dab of special soy and yuzu shavings, which really brought out the richness of the fish. I am very fussy about uni - it has got to be really good, or just not worth eating at all. 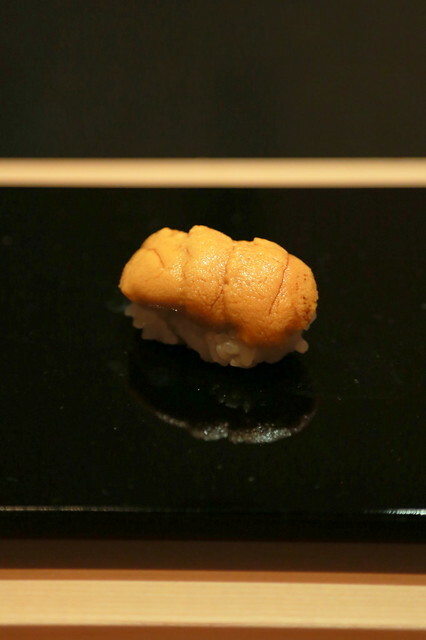 At Ki-Sho, the Hokkaido uni is beautiful and devoid of any metallic aftertaste. 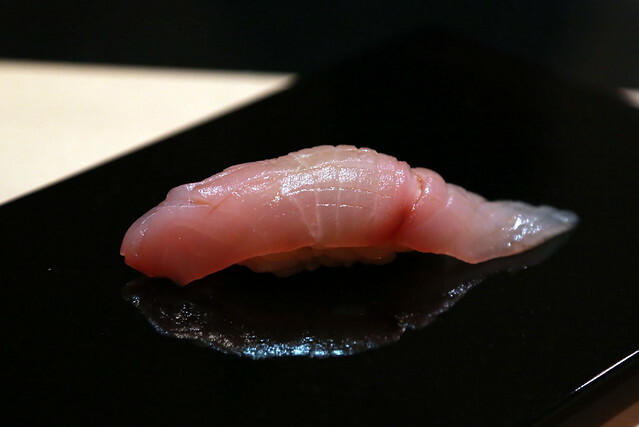 Saba nigiri sushi - I was pleasantly surprised to find it was done Kyoto style. 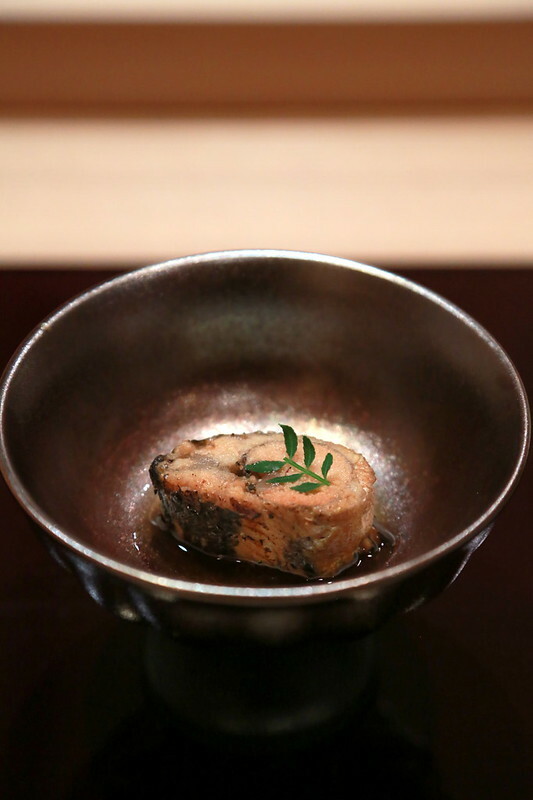 The mackerel is lightly pickled and salted, served with a very thin piece of kelp. Very nice. 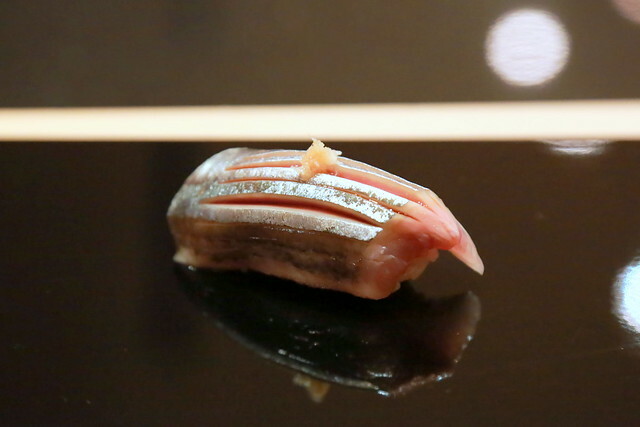 Sanma (Pacific Saury) with its trademark shiny skin. Autumn is peak season for sanma, so this is a good time to enjoy it. 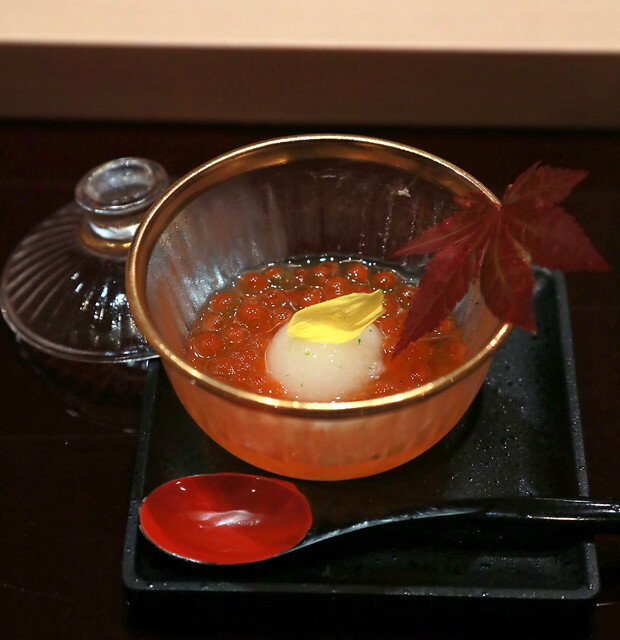 If you still have room after all that sushi, chef will make you a bowl of uni rice. Just say yes, because this is no ordinary uni rice. 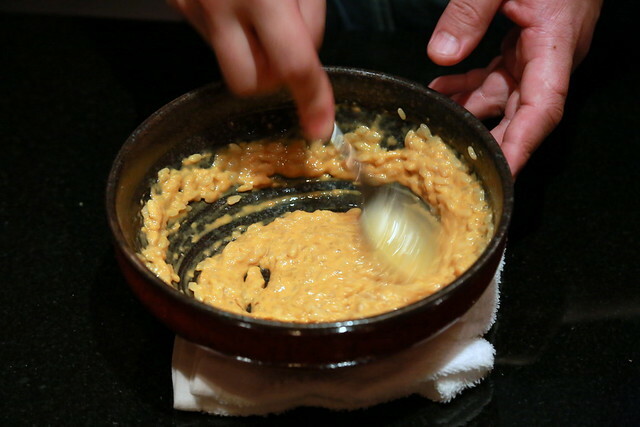 First, he mixes uni - divine uni and lots of it - into the rice, with a dash of mirin. Oh look at how creamy it is. But that's not all. Then he adds the toppings. 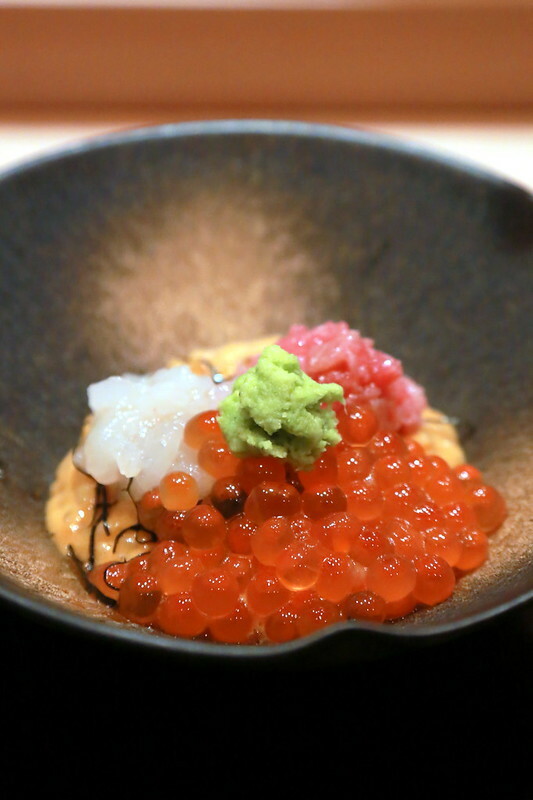 Decadent dollops of ikura, chopped toro, white shrimp and some seaweed. Voila! The pièce de résistance! Doesn't it look amazing? I almost had no heart to break it up and mix it up. But after your eyes are done feasting, just dig in and eat it. Oh how it will send you to heaven and make you invoke the name of God repeatedly. The combination is sublime - just these few ingredients, not more than seven (?) but it's so so good together! 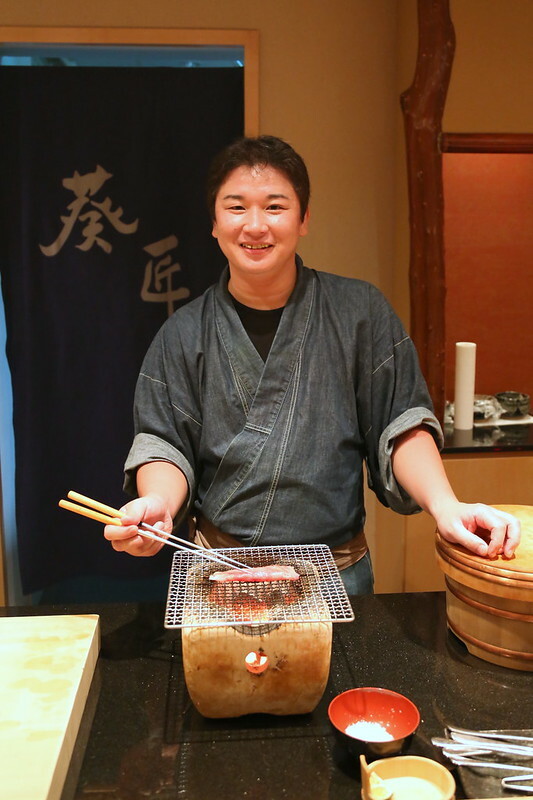 Chef Hamamoto does a lot of grilling on his little charcoal stove. Just a few seconds on each side for each slice of fish or meat. This is the real "aburi" - the common blowtorch version has the chef shuddering, "No, you cannot eat that. It's gas." Come to think of it, he's right. 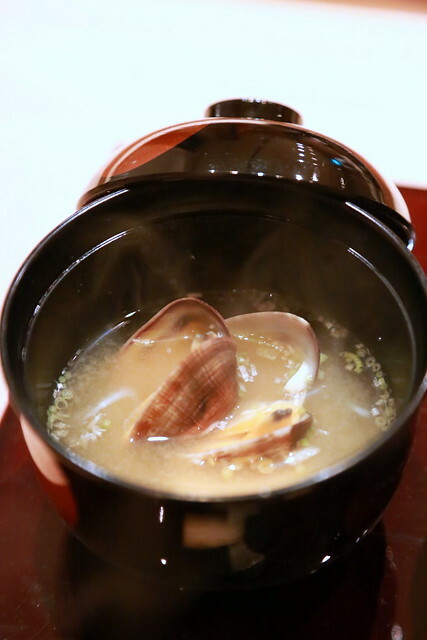 Clam miso soup signalling the close of the meal. Alas...all good things must come to an end. But there's still dessert! It's like a 3+1 petit four. Three little bite-size indulgences and a chilled fruit. 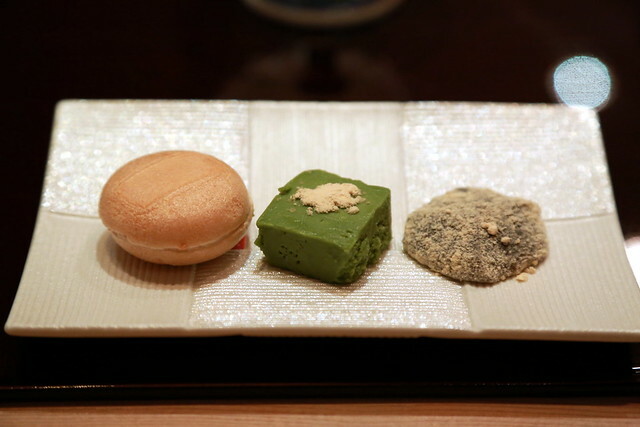 The roasted green tea wafer with cream looks like a macaron, but is ethereal in lightness, and not insanely sweet - the way I always wish macarons would be. 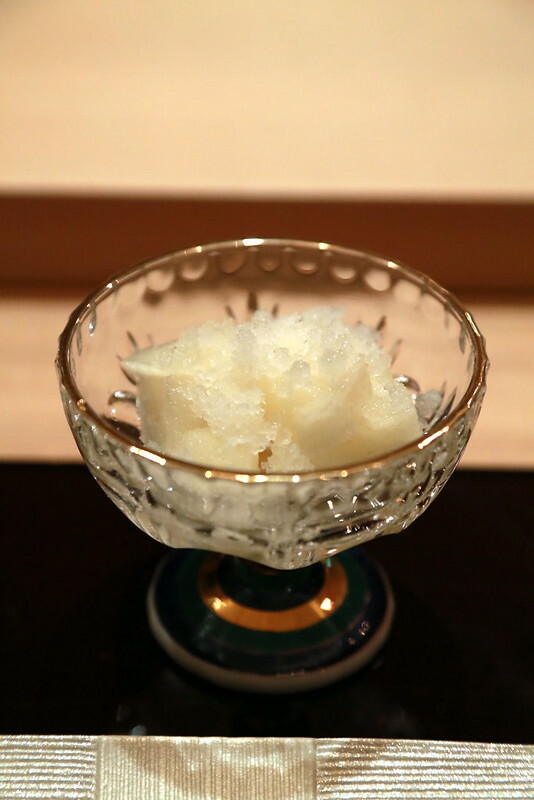 Chilled nashi pear with ice shavings that have to be spiked with ambrosia. How can something so simple be so delicious? But I like how fruit is always involved as part of Japanese dessert. Well, I lost count of the number of times I melted during this meal. The sake sommelier also recommended a great sake to go with the food - Hatsukame junmai ginjyo. Chef personally sources the 50 labels from Japan. There are several private rooms upstairs (one large room 12 seater; two smaller rooms 2-6 seater). A sake room downstairs seats 12. 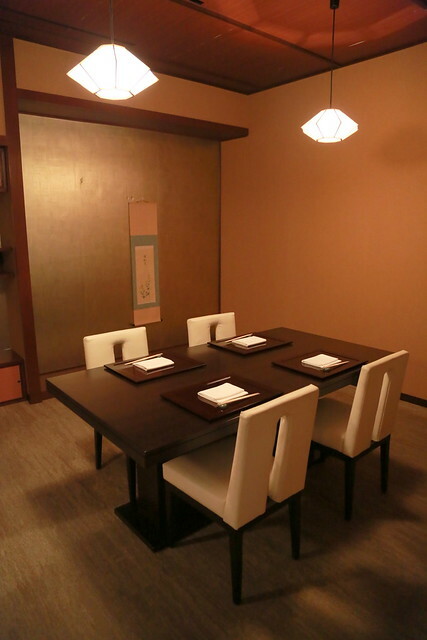 Ki-Sho only serves dinner but corporate or group lunches could be arranged. 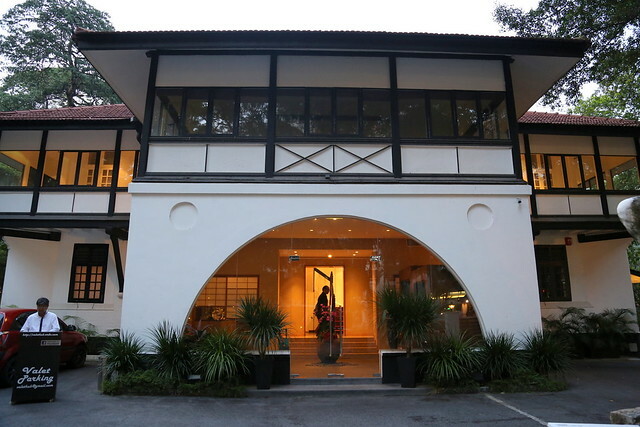 Look for Ki-Sho among the black and white bungalows along Scotts Road. It's part of Chateau TCC that also houses Buona Terra (Italian fine-dining) at the side. Maybe I should check that out too. 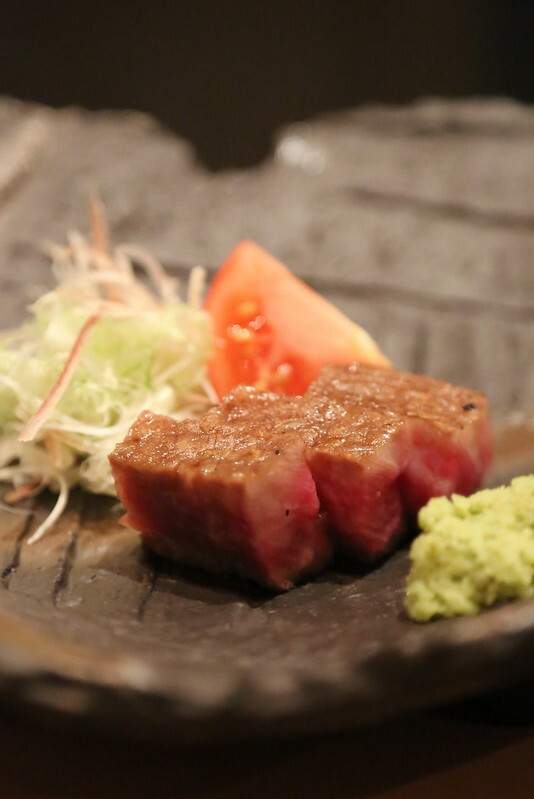 Reservations for Ki-Sho are strongly recommended. We were there on a Monday night, and it was full house. There's complimentary parking and valet services within the premises.